“The music, all written and arranged by Lucky, is melodic and intimately personal. In May 1952 Thompson recorded with Thelonious Monk for Blue Note and in April 1954 took part in a recording session with Miles Davis for his album “Walkin’” on Prestige. In his autobiography, Davis mentions that he learned about improvisation from Thompson and adds: “Lucky was a hell of a saxophone player. (…). 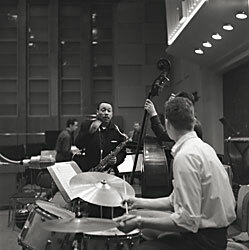 I got J. J. Johnson and Lucky Thompson for that session because I wanted that big sound that both of them could give me.” The first time Lucky Thompson visited Europe was in 1948 as a guest artist at the first Festival International de Jazz de Nice in France, playing in a group with Bobby Jasper, Jacques Pelzer, Fats Sadi, Toots Thielemans and others. Having lived and worked in Los Angeles and New York, Thompson was very outspoken about the unfair power of the music industry executives and the jazz business that he had difficulties dealing with. In order to escape these “vultures” as he called them, he moved to Paris in February 1956 and two months later embarked on a European tour with Stan Kenton. On alto saxophone was Klaus Marmulla who also remembers: “I was part of the Michael Naura Quintet and we always worked in clubs for one month and then we would travel on to the next city. In Hamburg, we were playing in a bar that was located in a cellar called 'Barrett', at the Colonnaden. 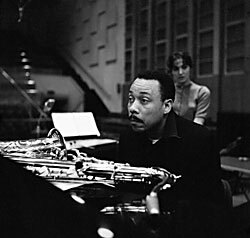 We were friends with Hans Gertberg who invited us to play with Lucky Thompson at the Jazz Workshop at Studio 10 where we rehearsed for a few days. 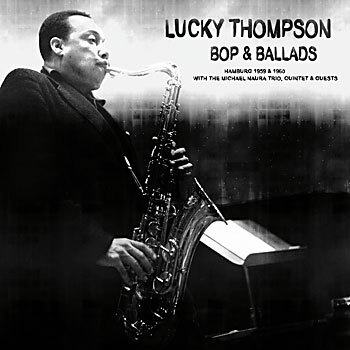 Thompson played with a very soft and beautiful sound on his instrument, almost in the style of Stan Getz.“ In “Loverman”, for example, Thompson starts out improvising with a chorus that is based on the theme. 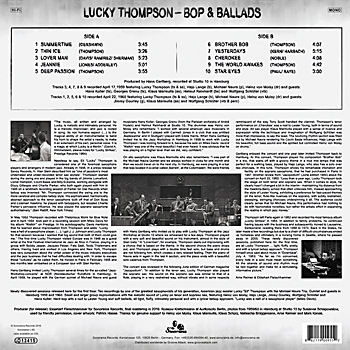 In the second chorus the piano drops out, and Thompson plays with a double time feel solo, but bass and drums are not following him, which creates a very relaxed feeling. Then the piano of Naura sets in again in the last A section, and the piece ends with a beautiful solo cadenza from Thompson. sleeve notes: Arne Reimer & Ekkehart Fleischhammer, cover artwork: Patrick Haase. Natascha Brüggemann, Arne Reimer and Mark Kanak.